Last Saturday, TS and I participated in a gathering of Vancouver bloggers and foodies for a night of Hunan food and fun. The Hunan dinner at Alvin Garden is the first dinner of a series of 8 dinners featuring the 8 Great Traditions of Chinese Cuisine (8GTCC). This series is the brainchild of Ben and Suanne of Chowtimes, one of the most widely-read Vancouver blogs. 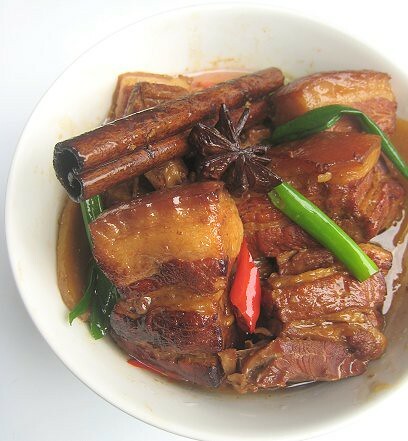 We so enjoyed our Hunan dinner that we thought we'd like to capture some of that "Hunan magic" with this dish, perhaps the most famous Hunan dish of all, Chairman Mao's Red-Braised Pork (毛氏紅燒肉). We used Fuchsia Dunlop's recipe from Revolutionary Chinese Cookbook: Recipes from Hunan Province . We tripled the recipe to fulfill our household needs, but will include the original below. 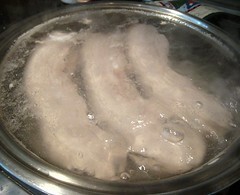 We started by placing the pork bellies in a pot of boiling water. This is done to "clean" the meat. Although the recipe doesn't call for it, JS also added just a tiny bit of vinegar to the boiling water. This gets rid of that "rank" porcine smell. It's a Chinese thing. Fuchsia (first name basis) actually explains this in detail in Land of Plenty: A Treasury of Authentic Sichuan Cooking . 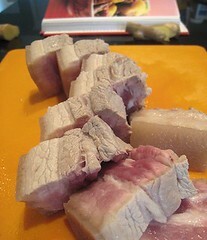 After 8 minutes or so, the pork bellies were taken out of their hot bath and sliced into smaller pieces. I readied the flavorings for braising: ginger slices, star anise, dried chiles and cinnamon. 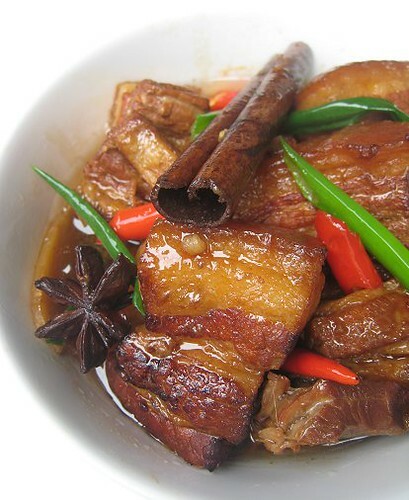 This dish belongs to the genre of dishes that we call "Chinese adobo." That is, we made up this "Chinese adobo" genre. 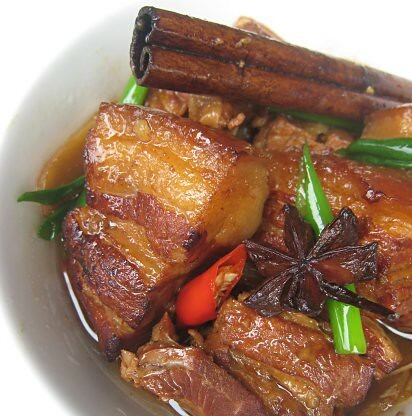 As with most Chinese adobos, we start by caramelizing sugar and oil. Although, I must admit, in our household, for our "Chinese adobos," we usually skip this caramelizing sugar step altogether. Reason being -- oh how it splatters! 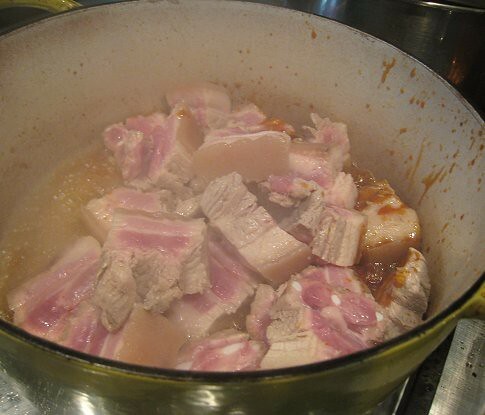 I had originally planned to take a picture of the sugar caramelizing in oil, but when the color reached a dark brown, I had to act quickly and dump the pork into the pot! Mixing pork with the caramel. 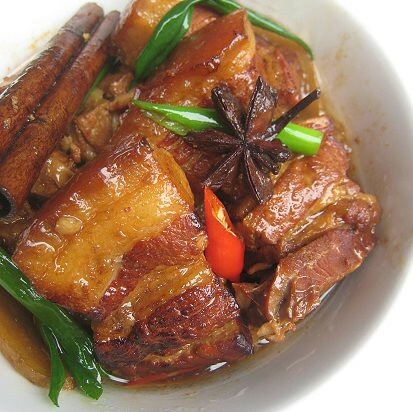 After the initial scary step of adding pork and Shaoxing wine to the caramel, the dish becomes a straight-forward affair of braising until tender. Surprisingly enough, the pot smelled like it had soy sauce in it! I added water to barely cover the pork bellies. Then, the ginger, star anise, dried chiles and cinnamon went into the pot. We braised the pork for about an hour or a bit more. When the pork belly pieces were tender, we took them out of the braising liquid. I let the sauce reduce a bit (just for a bit, as our family likes sauces more saucy than thick), then added soy sauce, salt and a touch of sugar. I was actually quite impatient with the rate of reduction so we added a bit of cornstarch slurry to thicken the sauce a tad. I must say I was pleasantly surprised by how much I liked this "Chinese adobo," thinking that I would compare the dish unfavourably with my favourite Filipino adobos. The flavours here were clean and very well-balanced (unlike the dominating sourness of Filipino adobo). The pork belly pieces were melt-in-your-mouth tender and lip-smackingly good. We'd like to thank Ben and Suanne, the team behind 8GTCC (fmed, Dylan, Joe, LotusRapper, Keev), and all those who attended the dinner for an enjoyable evening. We're looking forward to the next dinner. 1. 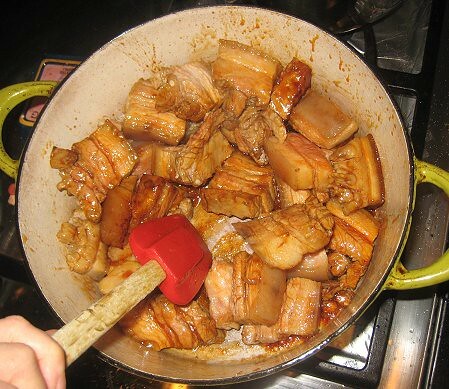 Plunge the pork belly into a pan of boiling water and simmer for 3-4 minutes until partially cooked. Remove and, when cool enough to handle, cut into bite-size chunks. 3. 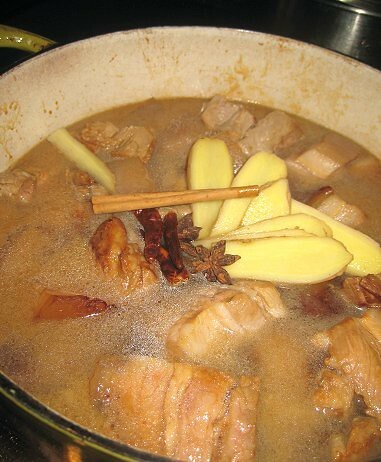 Add enough water to just cover the pork, along with the ginger, star anise, chiles and cassia. Bring to a boil, then turn down the heat and simmer for 40-50 minutes. Oh that one has my mouth watering! I want some & then I want to use leftovers as a bun filling. Drool.... okay, we definietly attempt this in the near future. Btw, I just tried a Philipino restaurant called Cullinayra in Coquitlam, apparently their chef is from Redakos. The Crispy Pata is so GOOD!! 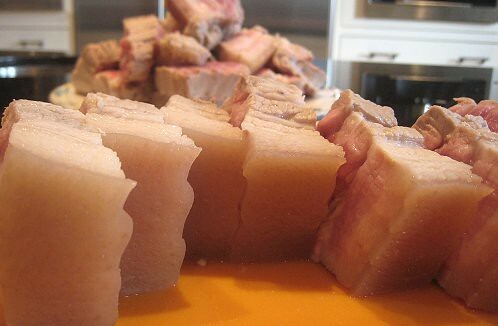 Can you ever go wrong with pork belly? 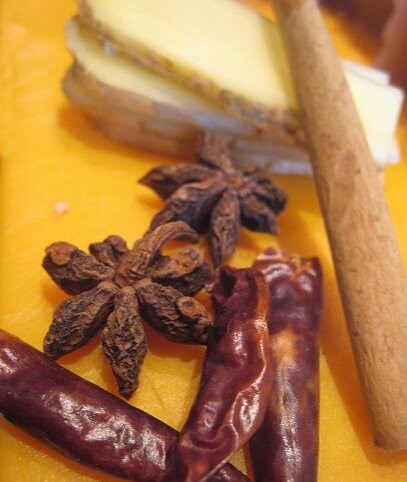 And star anise? And cinnamon? I agree with Kat - make some steamed buns with these! We hardly have any leftovers! Oh, is the chef Charlie Dizon then? In our case, buy those fluffy, fluffy, snow-white buns! Man, got reminded of the gua bao once again! Mmmmm. Yum; plus I get to learn a host of new techniques with your post! Thanks! What is with the Hunan frenzy? I actually just had Hunan cuisine for lunch today =) Should have taken you there for a meal when you were in TPE. My cheat these days is to use Indonesian kecap manis. Dark color and sweetness so I omit the soy sauce and sugar. Glad to hear you're enjoying the posts! Oh, when you put it that way, we could so totally do Vietnamese version next time! Am new to Vancouver and wonder where/what type of Shaoxing wine was used? Also, where can I get me some~? Shaoxing wine should be available in Chinese supermarkets like T&T. I don't actually know if the one we use is a certain type: it's in a dark brown bottle with red labelling.